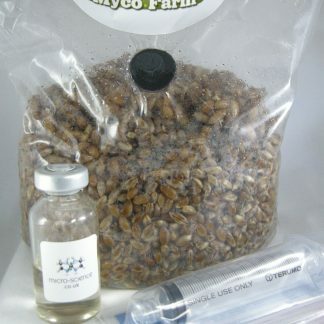 Everything you need to produce between 400-800g of fresh edible mushrooms (includes small culture spawn syringe* but can also be used with a range of cultures bought here or elsewhere). Kit contents: Bag with injection port containing 650g growing medium (sterile grain), swab, Casing mix (new! contaminant resistant polymer matrix) and humidity tent. 2.5mL Oyster culture spawn (per order). Sterility guaranteed for 28 days post-delivery (if unused). *One 2.5mL King Oyster culture spawn syringe per order. The system is flexible and can be used with a range of other culture syringes bought here or elsewhere. 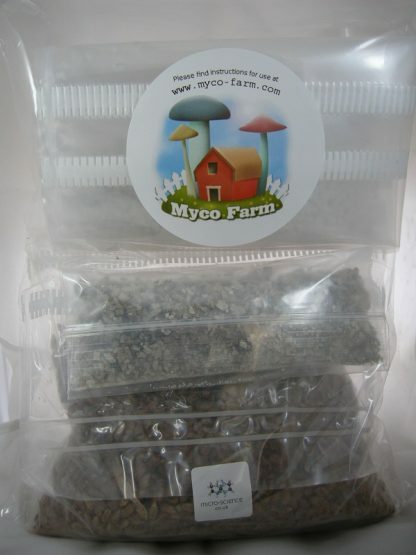 The MycoFarm mushroom growing kit allows anyone to grow a wide range of mushroom cultures from first principles. 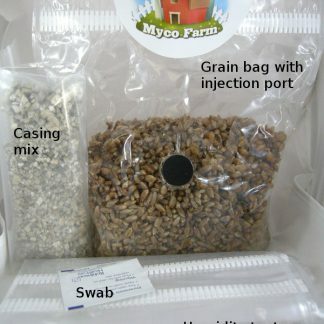 The kit is suitable for people who want to cultivate edible fungi from basics using a culture syringe (not included). It is a simple three-stage process and can yield several hundred grams of mushrooms over 2-6 crops. No air pumps are needed – it is a very quiet and unobstrusive system that can be left on a bookshelf. It is very useful to have a max/min thermometer so you can check your temperature range. Too cold will usually just slow things down at bit but temperatures over 35 C will kill many species. 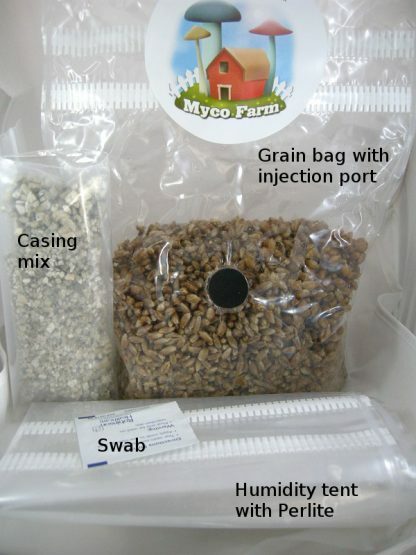 Kit contents: Bag with injection port containing 650g growing medium (sterile grain), swab, contaminant-resistant casing layer and humidity tent. 2.5mL Oyster culture spawn (per order). The first stage involves growing the white mushroom mycelium on a bag of sterile grain. We use grain as it is nutritious, easy to mix and allows the mushroom to spread quickly through it. This method is suitable for many different species of mushroom but temperatures will vary depending on the species grown. “Casing” is a term used by mushroom growers to describe the addition of a top layer. Although not all mushrooms need this layer, it is worth adding as it greatly increases yields. Casing protects the grain from drying out and also provides a good habitat for baby mushrooms to form and develop. We now use a new type of casing – dry polymer in a bag (which replaces the older “soil” in a tub). The dry polymer requires the addtion of hot water before use. Mushrooms are the fruitbodies of the mycelium – a bit like the apples on an apple tree. To let the mycelium know it is a good time to produce mushrooms we need to give it three signals: light, air exchange and a reduction in temperature. To do this we place the bag from Stage Two at a lower temperature in a humidity tent which allows light and air in.